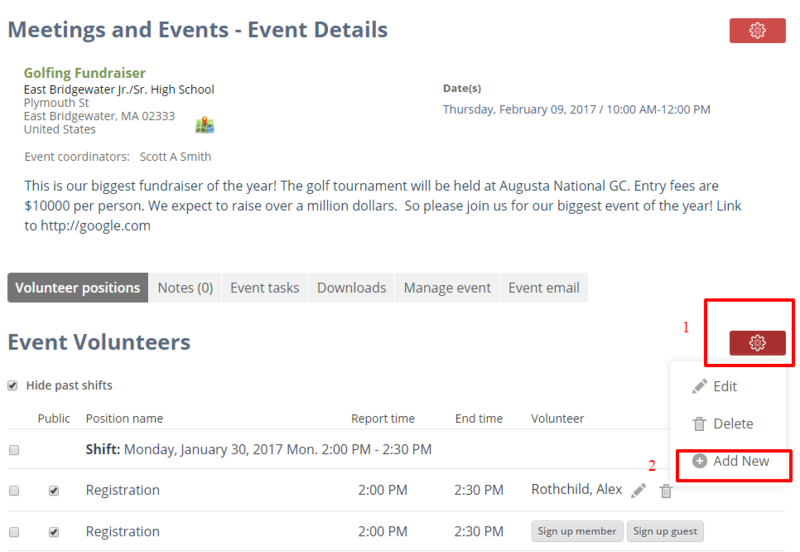 This article will show you how to add volunteer positions to an event in your group portal. Adding volunteer positions to an event helps your members to easily signup to volunteer and allows you and members to see where gaps are in event coverage. 2. Click the title for the event where volunteer positions are needed. Events are indicated by an E in the Type column. 3. Go to the Volunteer Positions tab, click the red Administration icon and select Add New from the list. 4. In the Pick event date text box, select a date by clicking the calendar icon to the right. 5. Select a Report time or time that the volunteer will start his or her shift by clicking the clock icon and selecting the shift start time. 6. Select an End time by clicking the clock icon and selecting the shift end time. 7. Edit the Position name textbox. 8. To select the number of positions needed for that role and time, click and slide the small button under the Number of positions heading to indicate the number needed. 9. Check the Display in public website box, if you would like this position to show on your public website. Note: If this is the first time that you are adding volunteer positions that will appear on the public website for this event, you will need to add the Event Volunteer control to the desired web page and configure it. Click article below for more information on the Public Website Event Volunteer control and configuration process.